ESPN’s “College GameDay” will have some competition next season. Fox announced Monday that it will air a Saturday morning pregame show opposite “GameDay” with Urban Meyer and Reggie Bush as part of the show’s crew. Sporting News first reported Meyer’s involvement with Fox back in January, weeks after his final game as Ohio State’s head coach. Now Meyer has formally signed on to team up with Bush, a longtime NFL running back who had a legendary career at USC, ex-Notre Dame quarterback Brady Quinn and ex-USC quarterback Matt Leinart, Bush’s former teammate. While “GameDay” is a three-hour broadcast beginning at 9 a.m. ET, Fox’s show hour-long show will begin at 11 a.m. ET, beginning with Week 1 of the college football season. Quinn and Leinart have worked on Fox college football broadcasts in recent years — Quinn as a color commentator for games and Leinart in studio. Rob Stone, who worked with Leinart worked on FS1’s pregame coverage; will host the show. Bush also has worked on television, primarily on NFL Network. For Meyer, the new show is a return to the airwaves after years on the sideline. Meyer, citing ongoing health issues, announced his retirement in December after his seventh season as the head coach at Ohio State. December’s decision marked the second time Meyer, who deals with the effects of an arachnoid cyst on his brain, retired for health-related reasons. Meyer left his job as the head coach at Florida after the 2010 season but stayed around the game in 2011 as an analyst for ESPN. In November of that year, Meyer was announced as the head coach at Ohio State. In Meyer’s time at Ohio State, the Buckeyes went 83-9, won three Big Ten titles and the 2014 national championship. Ohio State won the Big Ten in 2018 even after Meyer served a three-game suspension for his handling of the domestic violence allegations against former OSU assistant Zach Smith. Can this new show compete with GameDay? College GameDay is an institution in college football. Each week, it travels to the site of the college football’s marquee game, providing a unique on-campus setting. According to the New York Post, which first reported details of the new show, Fox’s new program will hit the road “for a handful games” that will be featured on the network. Otherwise, the show that will mostly air from the network’s Los Angeles studios. The crew the network put together is a strong one, but will that be enough to push viewers away from an established show like GameDay? It will be a steep hill to climb. 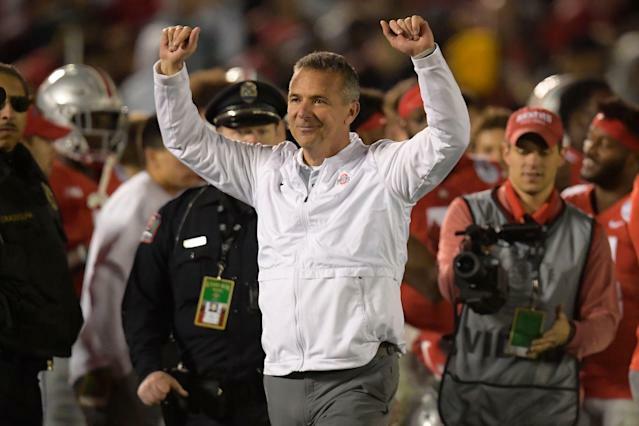 Meyer, who maintains he will not return to coaching despite being just 54 years old, is a polarizing figure across the country, but is beloved at Ohio State. He did well during his previous stint on television and could attract viewers, including fans who don’t hold a favorable opinion of ESPN.